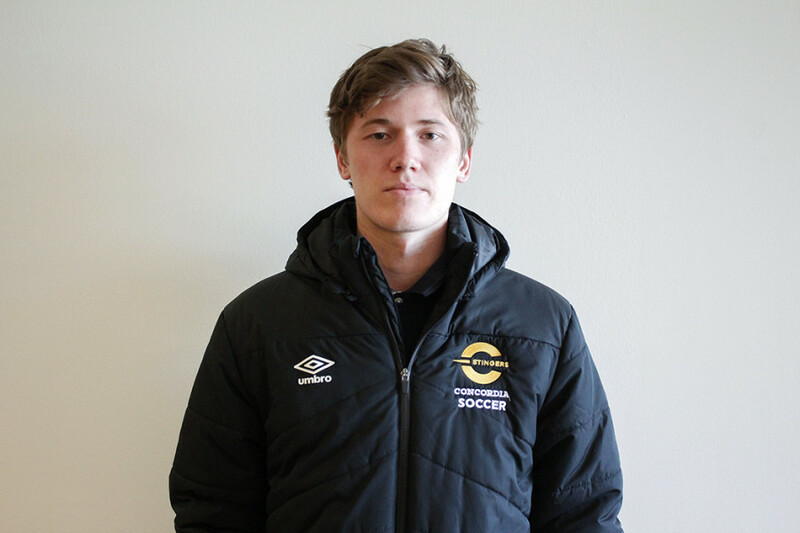 Athletes aren’t usually considered to be the artistic type, yet Stingers soccer player Alexandre Nay shatters that notion. A third-year student in the Concordia fine arts program and a defender for the school’s men’s soccer team, Nay has been able to juggle both his artistic career and his passion for the sport. Originally, Nay had planned to follow in the steps of his sister and become an architect, but these plans quickly changed soon after he saw what the work was like. It just wasn’t something that had appealed to him, Nay explained. This realization pushed him to pursue studio arts and enroll in Concordia’s fine arts program. It was clear that some of Nay’s work still had some architectural influence. One of his projects was comprised of two pieces put together to form a sphere; one half was very geometric, neat and symmetrical, while the other half of was a bit more abstract. Nay himself described his art style as being versatile. Most of the time, Nay’s work is colourless—portraying emotions of sadness and guilt—as he takes away from his surroundings. “In San Francisco it’s very sunny, but here it’s very grey all year long except for three months out of the year,” Nay explained, comparing Montreal to the city he was raised in. Scandinavian film is another inspiration behind his work, with its dark settings similar to Montreal’s appearance during the winter season. 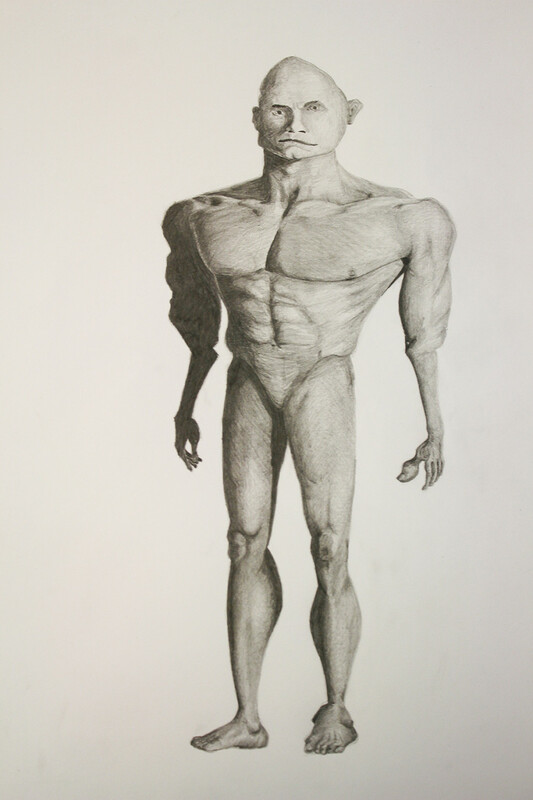 One of Nay’s projects involved body deformations. Like his approach to his art, Nay is versatile on the field as well, alternating between right-back and centre-back on defense. When asked what his playing style was like, Nay chuckled a little bit before answering. Having grown up in parts of Europe and in San Francisco, Nay had the opportunity to train in both of the different playing styles of soccer that these regions have to offer. “In Europe you get more technical training where you get comfortable with the ball. In the US you get more physical, like focusing on going fast.” Personally, Nay stated that he prefers the more technical European way of playing. His parents—both of whom currently reside in San Francisco—have been some of his biggest supporters in soccer and in art. Interestingly enough, his parents represent the best of both worlds; Nay’s mother Carole Neilson is an artist who’s been focusing her work on ceramics, whereas his father is the one who is passionate about soccer and encouraged his son to continue playing. Although Nay’s parents are on the other side of the continent in the US, they still do whatever they can to show their support for their son. “We are on their side being very supportive of the things they decide to do. I think in life, you just need to have energy and be passionate about something,” she said. Like his friend, Georges is in a similar situation—captaining the Stingers while also playing on defense, and pursuing a love for his music. As a soccer player, Georges described Nay’s playing style as poised and calm—a modest teammate who doesn’t tend to show off. The same could be said about Nay as an artist. “He doesn’t show [his art] off, not even on social media. And yet he’s so talented,” Georges continued. After he’s graduated from Concordia, Nay explained that he would be moving back to San Francisco to pursue a career as a graphic designer. Despite this separation, Georges seemed very confident that he and Nay would remain in touch and support each other. Georges and Nay both have one more fall semester together before they graduate in 2018.